Three interesting developments to note in the Iraqi Sunni insurgency file. 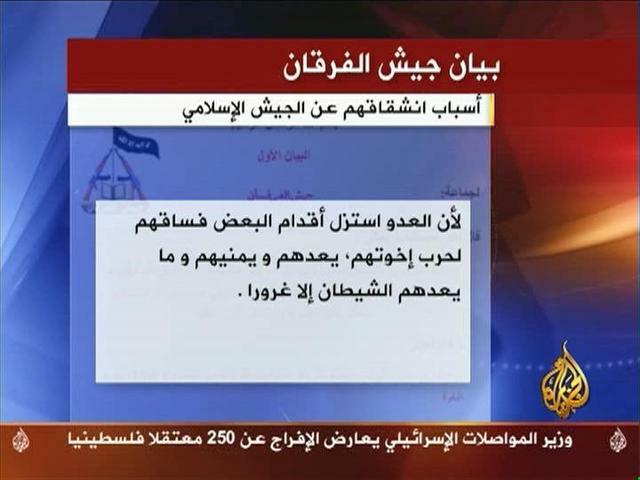 First, there's the US military's announcement that they captured Khalid Mashhadani two weeks ago. If true, that would be a major accomplishment, since from all I know he is in fact a serious player in the Islamic State of Iraq coalition. I'm skeptical about some of the things which the briefing claimed he said under interrogation - that he and Abu Ayub al-Masri made up Abu Omar al-Baghdadi and hired an actor to portray him in the tapes; that they took direction directly from al-Qaeda Central and that the whole project was only a way to put an Iraqi face on the foreign project. Maybe it's all true, maybe it isn't.. but with things like this it's always better to wait a few days to see how it shakes out before believing anything. Some conservative bloggers are marveling about how well Mashhadani's revelations under interrogation fit the American narrative ("One of the most interesting aspects of these revelations is that they support the principal counter-narrative that MNF is trying to promote: that of Iraqi nationalist and tribal groups struggling against the "outsiders", i.e. al-Qaeda, out to rule their country by remote control. "); others might be skeptical for exactly the same reason. But it makes good sense as part of an ongoing information operation aimed at using the 'al-Qaeda' card to reshape the narrative both within Iraq and in the US. For what it's worth - not necessarily very much - I haven't seen any reaction yet on the forums, nor have I noticed a change in the Islamic State of Iraq's online behavior in the last two weeks (when he was allegedly in custody). Second, al-Jazeera recently reported a major split within the Islamic Army of Iraq, with a faction calling itself Jaysh al-Furqan breaking off in protest over the IAI's alleged collaboration with the United States, its involvement in the political process, and its willingness to negotiate before final victory. The forums thus far seem cautiously interested, but uncertain about what's really going on. This would seem to be the first major fruits of the much-rumored internal strife within the Islamic Army over its new political strategy. Two important questions aren't answered at all by what's currently available on the forums or in the media: how many of the IAI's people (and guns) are siding with this new Furqan Army; and how the Furqan Army will deal with the Islamic State of Iraq (al-Qaeda). Finally, there have been some questions about the status of the Islamic Resistance Movement (HAMAS) - Iraq, which broke off from the 1920 Revolution Brigade with some fanfare a few months ago but since then has had little public presence (its website, for instance, is gone). The Muslim Brotherhood forum al-Multaqa recently posted a large document from Hamas Iraq explaining its goals, strategy, and political relationships, based on an ongoing organized dialogue with forum participants. Its presence on the Ikwhan.net forum, independently of the content, tends to support the argument that it represents a Muslim Brotherhood trend in Iraq. It's kind of fascinating, actually: the forum arranged a dialogue in stages, with the first batch of questions coming in from July 11-14; then answers from Hamas Iraq posted; then another round of questions and answers. Thus far more than 7500 people have viewed the dialogue, with well over 100 questions and comments. The Hamas Iraq participants portray the faction as a 'moderate, centrist movement based on the thought of [Hassan] al-Banna', with many members who follow the teachings of Sayid Qutb, and even a few salafis and sufis. It declares itself an independent faction with no ties to any political party, inside or outside Iraq - but leaves its actual relations with the MB unclear. It claims that the name Hamas Iraq has been around since 2003, and that the 1920 Revolution Brigade only referred to the armed wing. And it declares its goals as expelling the occupation by all legitimate means, while spreading 'centrist Islamist' thought throughout the Iraqi people. It claims to have almost 50 brigades operating in Baghdad, Diyala, Anbar, and several other provinces. It claims close and ongoing coordination with the Islamic Army of Iraq, the Jaysh al-Mujahideen, and several other like-minded factions, while saying that it has no relations and many problems with al-Qaeda because of its style of action. It criticizes the Islamic Party for its choice to participate in the Iraqi government, claiming for itself the mantle of the true Muslim Brotherhood. There's a lot more - with another round of questions from members being prepared. NOTE: it has been suggested to me that this would have been better as three different posts instead of one long one. Duly noted. Is there any indication that ikhwan.net is affiliated with the MB itself, or is it an independent site devoted to the MB? If it's the former, that might indicate a more official relationship, but I can't tell from the site if it is. About Khalid Mashhadani: it seems to me he's probably a well-known figure in Iraq, too well-known for the U.S. military to simply invent a story that he's captured, especially considering they produced a clear photo of the guy's face. So assuming the story of the Mashhadani capture is true, it seems like a rare victory in the battle for hearts and minds. All this time Al Qaeda in Iraq has been trying to convince the Iraqi people that it's leading a strong and growing grass-roots movement, complete with a govenmental body and head of state, and suddenly the whole political initiative turns out to be a foreign-based Internet hoax. Better yet, the gang of hucksters included "core" Al Qaeda leaders Osama bin Laden and Ayman al-Zawahiri. I don't think the Iraqi people will put much faith in a movement that has the credibility of a foreign phishing scam.